If you are a fan of magic, don’t miss the opportunity to witness the magic tricks of master illusionist Rick Thomas at the Andy Williams Moon River Theater in Branson. After Rick Thomas toured around the world covering over 50 countries, he now brings his jaw-dropping illusions and magic to Branson stage. As one of the best Branson shows, the Great Magic of Rick Thomas will stun audiences with his mind-bending illusions and spectacular magic performances. In this great magic show of Rick Thomas, you will enjoy splendid tricks and illusions that are beautifully backed up by enchanting music and elegant dancing to create a one-of-a-kind Branson show that is perfectly custom made for you. The magic show of Rick Thomas at the Andy Williams Moon River Theater is one of the nine featured shows in this same theater in 2014. Thomas have made headlines with his own Las Vegas show at venues including Planet Hollywood Casino, Sahara Casino, and Tropicana Resort & Casino. Thomas has also received the World Magic Award as Magician of the Year, and he has been honored by the Academy of Magic Arts as the Stage Magician of the Year. Also named as ‘Magician of the Year’ by the Academy of Magical Arts, Rick Thomas will take you on a journey into a world with a seamless mix of dance, music, and exciting illusions and stunning magic tricks. 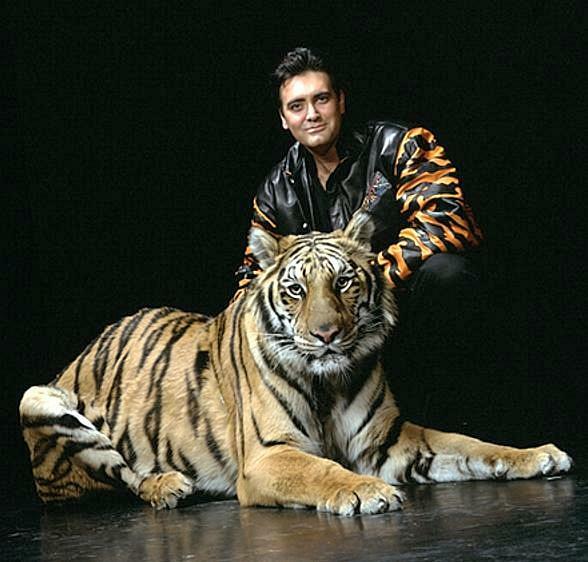 With two hours of fascinating magic performances, this great magic show features the extraordinary talents of Rick Thomas with the help of tigers, birds, and even participants from the audience can come up on stage as his assistant. This show is great for kids as they love to be involved in the show, and it’s interesting for parents too. In this entertaining magic show, Thomas performs the most intriguing and innovative illusions with a style unlike any other magician. His magnanimous stage presence that he honed during years of performing magic shows is complimented by ballroom dancing and graceful movements that audiences rave about. Rick is one of only few illusionists who also happens to have a great personality in addition to his incredible magic performances. Rick was also headlined at some of the largest concert halls and renown stages in the world – including a 15-year stint at some of the country’s most popular tourist spots. He has also appeared both national and internationally on numerous television specials including the famous “The World’s Greatest Magic Show” showcasing some of the world’s leading magicians and he also performed his magic act to over 300 cruise lines. Rick Thomas is one of the most popular performers in the world of magic that you may ever come across. His unwavering dedication has made him one of the most persevering magicians in the world today. He performs the most innovative grand illusions with a style like no other. The Great Magic of Rick Thomas at the Andy Williams Moon River Theater is one of Branson shows not to be missed this fall.